Edited: Per Boxfoot's explanation, I hereby deem Tobijah insufficiently obscure for this series. We'll go with Tyrannus instead (see comments). 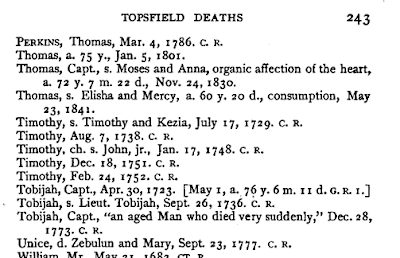 It raises an interesting question: which is a worse name for a child born in Massachusetts in 1775: Herod or Tyrannus? Not Tobias, not Elijah. Tobijah. While I accept that "Tobias" and "Tobijah" are different in English, historically I believe they are the same name, just in Hebrew and Greek. Elijah (אליהו, eliyahu in Hebrew) is rendered in Greek as Ἠλίας, Elias -- which is itself a not uncommon name in English, not to mention among Christian Arabs. Other prophets and figures of the Hebrew scripture whose names end with the characteristic -yahu ending, which means "of God," are also rendered in Greek/English with a -as or -ah ending: Yirmiyahu is Jeremias or Jeremiah, Yishayahu is Isaias or Isaiah. Similarly, it's not surprising that Tobias would be the Greek rendering of the name Tobijah (טֹובִיָּהוּ, toviyahu. Darn! Now I'll have to find something more obscure . . .
How about Tyrannus, the schoolmaster from Acts 19:9? Not only is it an obscure Biblical name, it is also a terrible, terrible name for an American born in the 1770s. 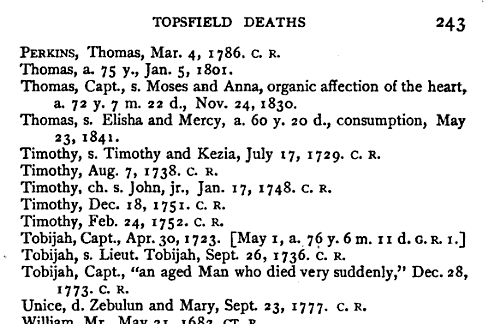 Taht didn't stop Tyrannus and Abigail Collins of Richmond, MA from naming their little sons Tyrannus in 1771 and 1775. Have you come across any Ahabs or Ishmaels? Ishmael Cutler was a black soldier from Arlington during the Rev War. Here's another Rev War soldier, Ishmael Spink. Ahab Whipple lived in Northbridge, MA in the early 19th century. And Ahab Read Farnum of Mendon.